On the tenth day of Christmas, Australian Bush Flower Essences gave to me… Old Man Banksia (Banksia serrata). Today we continue on a similar theme to yesterday’s post: taking better care of yourself and working out ways to better nurture yourself this Christmas. Old Man Banksia Essence is a very necessary Essence for you if you are a mother or father who is responsible for ‘making Christmas happen’ for your family. We already took a look earlier in the series at how you can reduce the additional burden the festive season adds to your schedule, and today’s Essence offers further relief to ensure you don’t get to the end of the season and suffer burn-out: emotionally, mentally and physically. You live on only 4-5 hours sleep, as the other 19-20 hours in your day are needed to take care of your entire household. You regularly feel weary and it takes a great effort for you to push your body into action – but you would never let your family down as you are the ‘rock’ whom everyone relies on. You are quite slow-moving but are determined to get each task or duty finished – even if it kills you! Energy replenishment for hosts: If you are always the person charged with hosting the family on Christmas day (and every family usually has one reliable host who gets stuck with the chore each year! ), then Old Man Banksia Essence can help you to keep well-energised by helping you to take care of yourself, and resting when you need to rest. It will also help you to delegate more of your chores so that you don’t get stuck doing everything, except enjoying the day, this Christmas. Reducing over-exertion and that ‘burdened’ feeling: Sometimes it can feel like you are carrying the weight of the world if you are the person in your family who takes responsibility for Christmas (and most of the chores the rest of the year!). Old Man Banksia Essence can help you to remove that feeling of being ‘burdened’ with the entire load of work around you, and instead make you more likely to respect your limitations, and only move as fast as you can go. One of the tendencies of the type of person who needs this Essence is to attempt to take on all responsibilities and workloads in every given situation, so this Essence can help you to realise that you are limited to what you can achieve in a set amount of time, and that sometimes things will have to be left undone. Being careful about what you ‘invest’ your energy in: Is it necessary to put so much effort into presenting your family with an absolutely perfect ‘Martha Stewart-esque’ Christmas? Or is it perhaps a ridiculous proposition to put so much effort into a single day that will be over before you’re even able to photograph the event for your Facebook album? One of the many benefits of Old Man Banksia Essence is that it encourages you to only put your energy and effort into what you can achieve and what is worthwhile to achieve. So that when you do put effort and energy into your family’s Christmas this year, it just might be ok to cut back a little on the traditional trimmings and let go of the unrealistic expectations that have ‘plagued’ you for years. 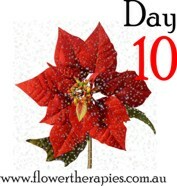 So there we have it: Day 10 of the ’12 Essences of Christmas’ and only two more days to go! I do hope that this series has been useful for you and would love to hear your thoughts in the comments section below. Join me again tomorrow for an Essence that can help you to continue on your path to taking better care of yourself this Christmas, even if caring for others is your sole responsibility (subscribe to my blog to ensure you don’t miss a post).